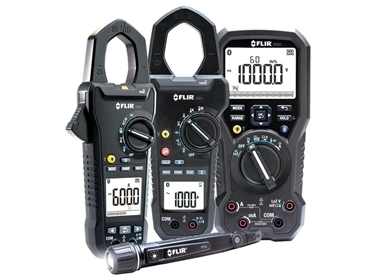 FLIR Systems Australia announces a new range of test and measurement equipment including electrical meters, digital multimeters, power clamp meters, multifunctional clamp meters, NCV detectors, moisture meters and videoscopes. Having established its global leadership in thermal imaging technology, FLIR Systems now introduces new test and measurement products incorporating the same standard for quality, accuracy, reliability, and durability, and engineered from the ground up to include world-class capabilities such as advanced diagnostics, enhanced productivity, and increased connectivity. FLIR’s three new electrical meters, the FLIR DM93, FLIR CM83, and FLIR CM78 all feature large/clear LCD displays, bright dual-LED worklights to illuminate dimly lit work areas, Bluetooth connectivity to Android and Apple mobile devices running the latest FLIR Tools Mobile app, and the ability to connect with METERLiNK-enabled FLIR thermal cameras so that users can embed electrical readings into their thermal images. The new FLIR DM93 is a rugged digital multimeter designed with advanced VFD filtering and shielding that help professional users accurately analyse non-traditional sine waves and noisy signals found in VFD-controlled equipment. Features also include LoZ Mode to eliminate ghost readings in long-run scenarios and Continuous Data Recording to detect intermittent glitches. The new FLIR CM83 is an industrial power clamp meter with power analysis and advanced VFD filtering for accurately testing three-phase systems and VFD-controlled equipment. Key features also include Harmonics Mode to find noise from different electrical draws, Phase Rotation to confirm power is evenly balanced, and Inrush Current to detect start-up related current spikes. The new FLIR CM78 is a 1000A clamp meter that combines a True RMS digital multimeter and non-contact clamp meter along with an IR thermometer with laser spot and a Type K thermocouple. Recommended for use on high-powered equipment, the new clamp meter enables users to take accurate AC/DC readings up to 1000A or 1000V safely and quickly. The FLIR VP50 is a compact, CAT IV-rated NCV detector featuring a powerful LED light for illuminating dimly lit areas, along with a dual-LED convenience light at the probe tip. Features also include vibration feedback and multi-coloured LED alarms for inspections in noisy areas, and high/low sensitivity works with industrial equipment and low-voltage systems. The new FLIR MR77 is a rugged moisture meter incorporating a pinless sensor and a wired pin probe to capture moisture readings up to 0.75" below the surface of various building materials, a spot IR thermometer with laser pointer, field-replaceable temperature/humidity sensor, Bluetooth connectivity to Android devices, and compatibility with METERLiNK-enabled FLIR IR cameras. The FLIR VS70 is a rugged videoscope with intuitive handset controls that let users manoeuvre the narrow camera probe into tight areas to deliver clear video and images to a large 5.7" colour LCD display. The FLIR VS70 features wide-angle 180-degree and standard 90-degree camera views, SD card storage of video, image and audio files, a six-to-eight hour battery life, USB port for convenient battery charging, and a headset that allows for voice annotations during inspections to clarify findings.